Earthy, romantic, soaring, energetic and bittersweet, this richly orchestrated music awakens and nurtures the mystic heart in us all and invites us to experience our own soul's journey as a never-ending process of becoming. Life can seem like a series of moments, many of them difficult and painful. Yet through the mystic heart, life is experienced as a wondrous journey. Earthy, romantic soaring, energetic and bittersweet, A Soul's Journey is a composition in eleven movements, each movement representing a universal life experience, from the heartfelt to the mystical to the purely energetic. Richly orchestrated and comprised of many and varied musical styles, this beautiful music awakens and nurtures the mystic heart in us all and invites us to experience our own journey as a never-ending process of becoming. 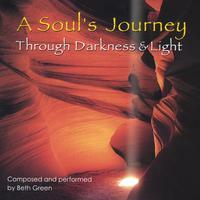 A Soul's Journey is Beth Green's second CD; the first was the very intimate and meditative program, The Gift of Peace, which Beth created to distribute free of charge to support the energy of peace on our planet. Excerpts can be heard on CD Baby, and it is still available free of charge through Beth's website, www.bethgreen.org. Beth's third CD, In the Mist, is also available on CD Baby. Each album is unique, but each carries a power connection to the divine. Beth is working on some brand new music now, and her music is evolving. We're looking forward to sharing some of it with you soon. Beth's output in different modalities is nothing short of amazing. In addition to being a composer, Beth is the founder of The Stream Center for the New Spirituality, which offers tremendous support and groundbreaking spiritual teachings, the author of 5 books, the founder of the Beth Green School of Intuitive Counseling, the co-founder of Consciousness Boot Camp and the creator of many different healing modalities. Currently,, she is offering a program called 15 MInutes with Beth, where in 15 minutes you will learn more about yourself than you thought possible. Plus she's the host of InsideOut radio on VoiceAmerica.com and the creator of Beth Green TV & Radio on YouTube, which is full of her profound, funny and insightful videos. And all of this is despite chronic and debilitating illness since she was 15 years old. But then Beth has always been breaking the mold. From a young girl until the age of 35, she was a social activist, standing up to popular beliefs and confronting whatever authorities were supporting destructive social policies. (For an example, at the age of 9, Beth was nearly expelled from elementary school for fighting for the principle of separation of church and state.) Throughout her days as a social and political activist, she rallied behind unpopular causes, if she believed them to be right. Then at the age of 33, Beth had a complete turnaround when she experienced a spiritual awakening. In fact at 35, this blossomed into a deeper connection with higher consciousness and in one day, she became an intuitive counselor, being trained on the inner planes. From then on, she devoted herself to helping shift consciousness on the planet from an ego-based perspective to a worldview based on Oneness. Once again, she was unpopular. When others were teaching people how to gain advantage through manipulating the laws of the universe, Beth was calling us to self-awareness and confronting our egos on both the individual and collective levels. Today, Beth's message is becoming more and more welcome and heard. Her YouTube channel, Beth Green TV & Radio, is exploding, people are beginning to relate and resonate with her message to confront our egos -- even in our spirituality and religions -- and folks are beginning to take advantage of her incredible intuitive gifts through attending her workshops and utilizing her private consultations. Her music is also becoming more known and it is spreading the energy that imbues it, as well. All of this is possible because of Beth's connection to the divine. She has been chronically and severely ill since the age of 15, and yet her connection to higher consciousness has enabled her to have a life of creativity and service. Here are a couple of Prior to that she was a social activist, working to support positive change on our planet. In her mid-thirties, she had a spiritual/psychic awakening and discovered her great intuitive capacities and healing power. Since then she has devoted herself to promoting deep inner change and growth, which supports not only the individual but the whole society of which we are a part. She has also taught others to do the same. Finally, we'd like to expand a bit on the discussion of Beth's health. Born in 1945 in New York City, Beth seemed destined to become a musician, but at the age of 15, she became ill, and her lifelong chronic and debilitating illness prevented her from pursuing music. In her 50s, Beth discovered electronic instruments and has found a way to her musical expression. With her indomitable spirit, she has faced chronic illness and, instead of giving in to illness and pain, she has become a true healer. Her intuitively guided music and words are dedicated to the healing of our planet, and so is her life. For more information, check out Beth's website at www.bethgreen.org for more info. An inviting musical journey well worth taking. The CD is peaceful, reflective and transends time and place to a beautiful mediative score. The music favorite when I need to relax, focus and find clarity.